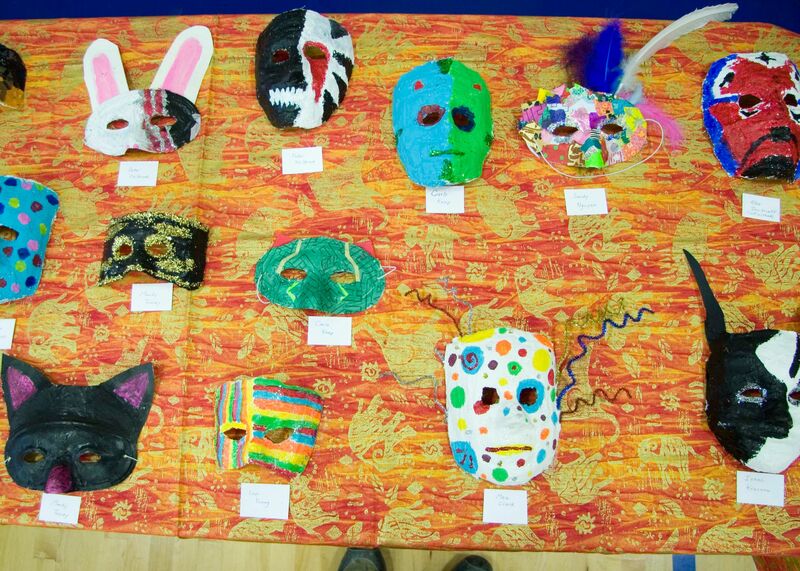 After celebrating her school’s 20th annual Arts Week, an elementary school teacher shares how to put on an event like this. Mount Desert Elementary School celebrated its 20th annual Arts Week last year, and we’d like to share some of the ways our school community has grown from this unifying experience. Making connections with community artists and involving them in students’ learning during a school-wide immersive experience has transformed our school. It’s important to begin growing community connections and art experiences in your school by taking the first step in a way that feels right for you. Inviting an artist into your school for an afternoon or a day, for example, is a great way to start. Our school started small, organizing a variety of art experiences for students over the years. We began with an Art and Nature Day for our fifth graders at a local camp. That allowed us to integrate art with science (cyanotype sunprints), English language arts (observation journals), and PE (dance and movement). Next we organized a weeklong residency with one artist, and over the years this expanded as student excitement grew. We now have a week of immersion in the arts, giving students choices for personal expression, new opportunities for mentoring, and a wide range of experiences that allow for social and cooperative learning. New art experiences continue to evolve and grow as everyone in our school community shares ideas and resources. Parents and teachers have much to offer—a grandmother might teach knitting while a dad offers a cooking lesson and a teacher demonstrates jewelry making with beach glass. And through grants, fundraising, and eventually a line in our school budget, we’ve been able to compensate professional artists for their involvement. Students produce a rich variety of work during Arts Week. It’s important to have your whole school community involved in Arts Week. If a middle school teacher doesn’t feel ready to teach an activity themselves, they can assist and learn in a professional artist’s workshop. Younger grade classroom teachers attend and learn new things with their students in all the workshops. Being a learner along with your students is a powerful connecting experience for everyone. Over the years, we’ve had teachers grow from learning a skill to feeling confident enough to teach it, including activities like needle-felting, carving walking sticks, spoken-word poetry, making Fimo clay jewelry, and making art by altering books. Arts Week is an opportunity for students and teachers to elect what they do. Any opportunity for students to choose and learn based on their interests is welcome, and the arts are a great way to allow for this kind of choice and personal expression. One student may be learning to measure and build by pounding nails with a hammer. Another learns with fabric, pins, and a sewing machine. Still another is building an epic poem with pen and paper, word by word. Having a range of activities and allowing for personal choice creates opportunities for small-group learning with new peers and leads to strong student engagement and enthusiasm. We end our school’s Arts Week on Friday afternoon with a performance and exhibit of all the creative work students have made. This allows them to share with others—parents, community members, teachers, and peers—and to reflect on what they’ve learned. Every student gets a chance to shine, whether it’s a quiet student’s show-stopping performance of a song or an active student’s carefully carved woodblock prints. We’ve had students return to tell us they wrote about their Arts Week experience in a college essay or even chose a career path based on something they learned and became passionate about during Arts Week. Setting up a strong theme has a unifying effect with any immersion art experience. 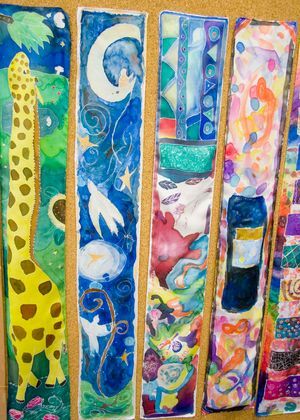 We’ve used themes like “Color, Transformation, Pattern, Nature” and “Arts Around the World.” A theme allows for a common focus and adds a rich layer to the week’s learning. It can also give teachers the opportunity to plan lessons in their subjects around the theme. It’s a natural step to turn a science or math class into an art lesson. Good teachers do this all the time, knowing how important it is for students to learn concepts visually and experience ideas through hands-on activities with tools and materials. The problem-solving and imaginative thinking that takes place in this kind of learning helps our cognitive abilities grow and flourish. A unifying theme also sets teachers and students up to decorate their classrooms and school hallways, and we’ve added dress-up days as well: Color Day, Black & White Day, Pattern Day, World Day—wear something from another culture—and Be Yourself Day. Think of Arts Week as a large spoked wheel with art at the center. Each spoke connects the arts to another subject for a full, integrated learning experience. We all know the arts often play a less-than-central role in a school’s day-to-day schedule, while in life they’re an important part of our culture and rich human experience. An Arts Week, or any immersive art experience, will boost personal creativity, educational engagement, and emotional well-being in both students and teachers. Everyone gains a greater understanding and love of art while building unity and sharing in the community spirit. Start big or start small, but give it a try and see where the power of art leads your school.